[Translation: This video contains content from Sony Music Entertainment. It is no longer available in your country.] I find this doubly annoying. 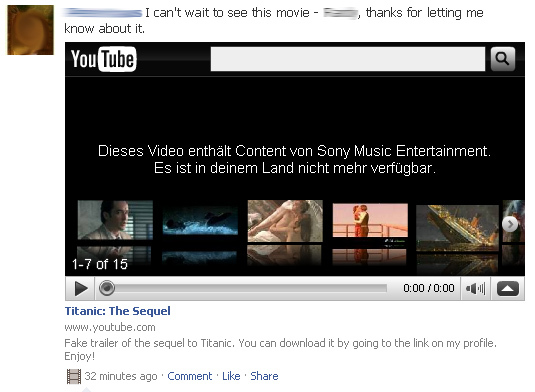 For one, I cannot see the fake trailer to the Titanic sequel, which pretty much lowers my quality of life a few notches right there. Adding to the agony is the fact that the content was once available, but no longer is, which makes me feel like I missed out on some great moment of free-ranging content. Smack, smack. Ouch. This is not good customer management, and just drives people toward illegal sources for their media. As this graphic humorously portrays (from Reddit user Question Everything via Leander Wattig), pirated media is easier to use than legit content, which pretty much anyone over the age of ten knows. This needs to change, or things are just going to get worse. Say, if anyone living in a country where this content flows freely felt like ripping and shipping this video, I would sure appreciate it. The FF extension 1-Click YouTube Video Downloader works like magic.